Archbishop of Perth Timothy Costelloe SDB together with Monsignor Brian O’Loughlin and Dianna McKenzie, member of the parish council and social organising committee at the celebrations for the centenary Anniversary of St Columba’s Parish on 29 October. Photo: Natashya Fernandez. “I rejoiced when I heard them say, ‘Let us go to God’s house’ – and now our feet are standing within your gates, O Jerusalem (Psalm 122). These were the words that Archbishop of Perth Timothy Costelloe SDB said as he welcomed parishioners to the centenary anniversary celebrations of South Perth Parish on 29 October. “These words capture something of the joy which I suspect many of us feel as we gather in this historic Church to celebrate the 100th anniversary of the formal establishment of the parish of Saint Columba and the appointment of Father Raphael Pace as the first Parish Priest of the Catholic community which gathered on this site to celebrate Mass,” the Archbishop said. We are gathered here in this historic Church to celebrate the centenary Anniversary of the formal establishment of the parish of Saint Columba and the appointment of Father Raphael Pace as the first parish priest of the Catholic community. Photo: Natashya Fernandez. Archbishop Costelloe was the principal celebrant of the Mass together with Parish Priest Monsignor Brian O’Loughlin PP, Rev Fr Michael Casey PE and Rev Fr Manoel Borges LCL. Parish Pastoral Council Chairman Nigel Rayney, said the Mass is a wonderful opportunity for everyone to share in the rich history of the Parish and presented an overview of the celebrations, including the launch of the Parish History Book and the blessing of the Columbarium. He also welcomed many distinguished guests, especially the Sisters of Mercy and the Sisters of St Joseph of the Sacred Heart as well as parishioners. Parish Priest Monsignor O’Loughlin said the celebration was a joyous occasion to remember the rich history of the Parish and all those who helped make it possible. “The Parish History Book makes an engaging read for all those who have been a part of it, some of whom are present today, especially Fr Casey,” Monsignor O’Loughlin said. In his homily, Archbishop Costelloe touched upon the history of the parish since 1908 when the Catholic School was run by the Sisters of Mercy and later under the stewardship of the Sisters of Saint Joseph in 1915. “The Church in which we are celebrating today was blessed and opened in 1937, 20 years after the establishment of the parish, and of course, since then, the story of St Columba’s has been one of continued development and growth. “I am sure that the first groups of Sisters here, and in a particular way Fr Pace, could not have envisaged what the next 100 years would bring, just as we today cannot imagine exactly what St Columba’s will look like, and feel like, a hundred years from now. “What we can do today, of course, is to look back with gratitude and a sense of awe at what has been achieved, look around with pride at the richness of the community which gathers in this church today, and look forward with confidence to all that the future will bring,” he said. 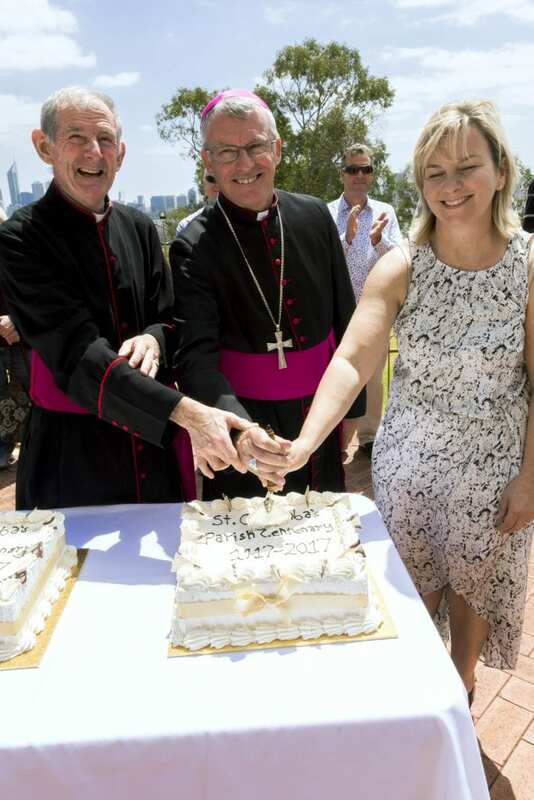 The Archbishop said that in doing those three things – looking back, looking around and looking forward, we realise that the celebration is not about the material achievements but the fidelity of the Gospel which has marked, continues to mark, and will continue to mark the presence of the Catholic community here in this part of Perth. Parishioners Laurence O’Meara and Peter Lee, co-authors of the Parish History Book presented a bound copy to Archbishop Costelloe, who officially launched it. Photo: Natashya Fernandez. In launching the Parish History Book, he said that even though he has not read it yet, he is confident that it will tell a story of fidelity. “Fidelity to the Gospel is of course the only criterion by which we can truly measure ourselves as individual Christians and as a Catholic community. “Even though, if it is an honest history, it will also tell of moments of less than perfect fidelity, both on the part of individuals and by the community as a whole. It is important that we acknowledge both, in our own individual stories and in the communal story of our Church. “From its very beginnings the Church has been marked by extraordinary fidelity – the patron of your own parish, St Columba, is but one of countless thousands of examples of this – but the Church has also been disfigured by the infidelity of so many who through malice, weakness, fear or obstinacy, failed to live up to the high ideals to which the Lord continually and consistently calls us all,” the Archbishop said. He reflected that in the Gospel reading of Matthew 22:36-40 asks the question whether we too are like some of the Jewish leaders, uncomfortable with Jesus and would like, at the very least, to keep him at a safe distance so that he does not upset our comfortable way of thinking. “Because, inevitably the more we open ourselves to him, Jesus will upset our comfortable ways of thinking and acting. This is perhaps no more obvious than in the answer he gives to the question asked of him in today’s Gospel. “Rather than give just one answer Jesus gives two – you must love God with all your heart, soul and mind. And you must love your neighbour as yourself. Both answers reflect traditional Jewish teaching. “Today we pray in remembrance and gratitude for all those who for the last one 100 years and more strived to be faithful to this ideal here in this parish. We acknowledge with admiration and with gratitude all those who work together in our own time to give expression to this ideal of faithful discipleship. “And we entrust to the Lord with hope and confidence all those who will come in the future to St Columba’s to be a part of the on-going story of fidelity, giving expression to the hope expressed by the Lord Jesus himself at the Last Supper – By this will everyone know that you are my disciples; that you love one another as I have loved you. The Archbishop blessing the newly built Columbarium and unveiling the beautiful marble replica of Michelangelo, Pieta. Photo: Natashya Fernandez. At the conclusion of the Mass, parishioners Laurence O’Meara and Peter Lee, co-authors of the of Parish History Book, presented a bound copy to Archbishop Costelloe, who officially launched it and said the history of any parish, and any parish church, is a history of God working powerfully in people’s lives, often in ways we can see but more often in ways that we cannot. “Jesus once told his disciples that he had come so that people might have life and have it to the full. As you read the story of this parish, of your parish, I hope that you will be able to read it in this light: as a testament to the never-failing, powerful, compassionate and liberating presence of God who called this parish into existence, continues to enliven it with the gift of his Spirit, and will never abandon it,” the Archbishop said. Mr O’Meara fondly reflected on co-authoring the book with Mr Lee and said that there was always something special about St Columba’s, and particularly about the Church. “A Church so beautiful that it needs no internal embellishment. Our research indicates the importance of maintaining its elegant simplicity. My personal memories go back to 1952 when our family moved to South Perth from the country and I was an altar boy for Monsignor McMahon. “Our aim from the start was to write a readable history; a history which has some colour, some anecdotes, while at the same time giving the reader a taste of the rich history that abounds here,” he explained. After the Mass Archbishop Costelloe blessed the Columbarium and unveiled the beautiful marble replica of Michelangelo, Pieta. This was followed with morning tea and the cutting of the cake, and celebrations with all parishioners together with the sale of the Parish History Book, ‘100 years on Barney’s Hill: a history of St Columba’s Parish South Perth’, at 20$ per copy.